As Americans prepare to celebrate the 4th of July this weekend, many of us will enjoy fireworks and cookouts in parks and backyards. It also means that summer is here and temperatures are on the rise. Folks out in the western states are hitting record highs so early in the season. And excessive rains are causing severe flooding in the East. Regardless of where you are, the summer heat and sun is sure to wreak havoc in your garden this season. Here are a few things you can do to help keep your garden growing, even in the harshest summer conditions. 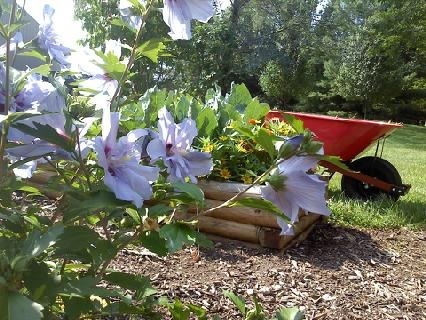 Spread a Layer of Mulch – a 2-3 inch layer of organic mulch helps the soil retain moisture and helps reduce the rate of evaporation. It also helps to suppresses weed growth which if allowed to grow, take up precious water and nutrients from your plants. Natural mulches will also break down over time and provide nutients back into the soil. DON'T FORGET: When it comes to your trees, avoid piling mulch up around the base of the tree and trunk. I can damage your tree by inviting fungus or unwatned pests. Better to mulch out than up! Convert Spray System to Drip – The key to proper watering is a slow and steady drip that has time to penetrate the soil. Over head sprinkler system have come a long way in being more efficient but are still prone to evaporation and excess run off. Converting a planter with a drip system can be quick and inexpensive. You'll see the return on you investment in your monthly water bill too. 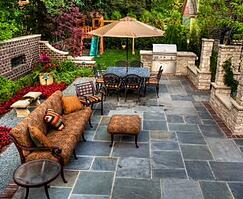 Less water and healthier plants, even in the hot summer months. For more information, check out the EPA WaterSense website. Water Early Mornings – a good long soak in the early morning hours allows more water to absorb in the soil and minimize water evaporation. Avoid watering in the afternoon or hottest parts of the day as the majority will evaporate quickly and never penetrate the soil or reach the plant's roots. Another reason early mornings are best is the air is typically calm with less wind. 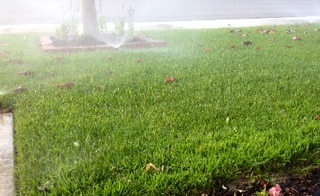 Spray from sprinklers is more likely to water your lawn instead of being carried off to your neighbor's! Set Lawn Mower to Highest Setting – If you have a lawn, keeping your grass taller is better for its overall health. Taller grass will help it retain moisture in the soil during extreme temperature and heat. Think of it as a thick blanket on top the lawn's root system. It protects the soil from the hot mid-day sun, will require less water to keep it green and saves you some green in your utility bill too. Use Native Plants – Natives and adaptive plants can survive on less water or tolerate excessive rains and humidity. And these days your choices are not limited to cacti or succulents either. 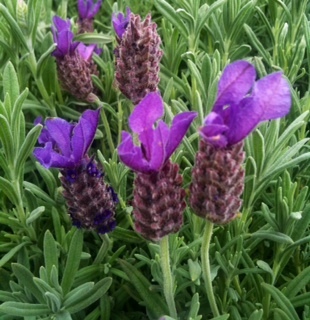 Your local garden centers offer a wide selection of native plants. Just look for lables that state low water or thrive in the local climate. Your county extension can provide you with a list of natives for your area. There you have it, 5 easy ways to help beat the summer heat in your garden this summer. What other things do you do to help plants survive in your garden when it's hot? Share it with us in the comments below! Just before the school year ended, my daughter received a fun project from her 2nd Grade teacher. The assignment was aimed at teaching kids about recycling and how they can be stewards of the environment. 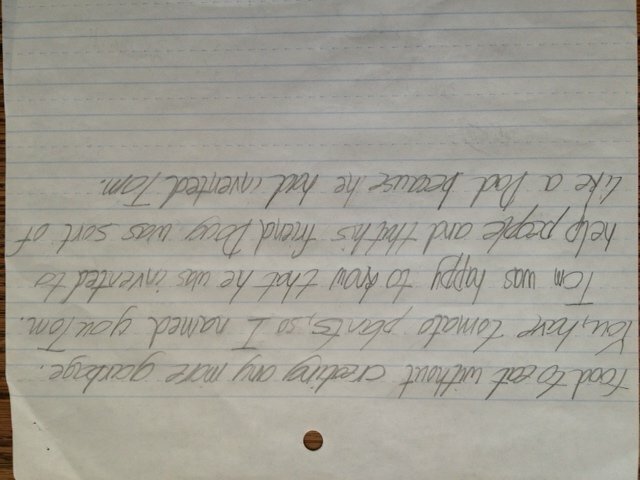 Each student was asked to build a robot made of recycled materials and write a story about their “recyclobot”. We stated putting aside all of our bottles, cans and anything else that could have been used to make a recyclobot. Once we had plenty of items to choose from, I helped my daughter put some of the items together as outlined in the assignment. It was at that point, my daughter’s 8 year old imagination kicked into overdrive. She decided she wanted her recyclobot to be a “grobot”. Okay to be fair, she had just watched the movie Wall-e, but she decided she wanted her recyclobot to be able to grow something inside of it and further challenge her dad! But I liked that she was giving 200% to her assignment so I went with it. She developed and wrote her story about Tom the Grobot, and I helped put him together. I thought why not push the envelope and teach her a little bit about sustainability in the garden while I was at it? I thought I would utilize some of the knowledge I impart from our weekly #landscapechat and introduce her to the concept of collecting rain water and proper irrigation techniques. 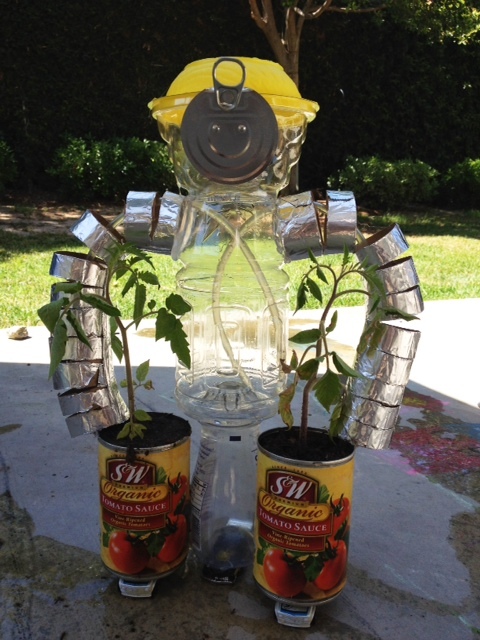 Tom was not only made of 95% recycled materials (the other 5% were some HotWheels borrowed from my son) but he was designed to harvest rain water and to water the tomato plants he was nurturing. 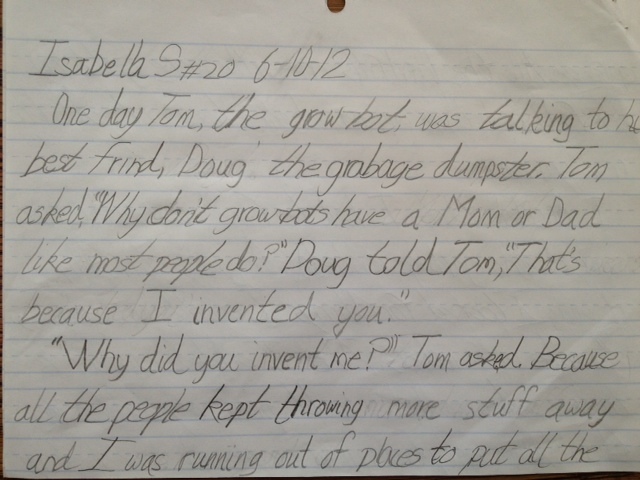 My daughter came up with an amazing story about Tom the Grobot and Doug the Dumpster. And when she presented it to her class, both her story and Tom got the biggest round of applause from the classroom. What impressed me the most was at 8 years old she understands the importance of; recycling, its impact to our landfills, a broad concept of sustainability and turning trash into something that gives back fresh grown food. I loved what she came up with so much that I decided it would make a great blog post and awesome project to work on with kids this summer. So start saving those bottles and cans share your creativity with us on Corona Tools Facebook! With record temperatures heating up most of the country this summer, gardening is probably one of the last activities we want to think about doing. It's important to keep in mind that during excessive heat, it's as vital for us to stay hydrated as it is for our fruits and vegetables out in the garden. Here are a few things to keep in mind along with an easy low cost solution to help get you and your garden through even the hottest days! Its Hotter Than You Think Plants located near buildings, block walls or roof tops for example, are subjected to elevated temperatures. Stucco, concrete and roof tops trap and hold the heat which can raise the temperature surround your plants by as much as 10F! If You Must Garden - Don't work in the heat of the day! While this may sound obvious, gardening in the heat and sun can cause severe exhaustion, heat stroke or even death. Tend to gardening related activities in the early morning hours or evening when temperatures are cooler and out of the direct sun. If you can't avoid it, try using a pop-up shade cover or patio umbrella over the area you are working in to provide some instant shade. And remember to stop frequently and drink plenty of water. Patio and Containers Need More Water Plants in pots or containers require more water that those in the ground especially in hot weather and those near structures or concrete patios. 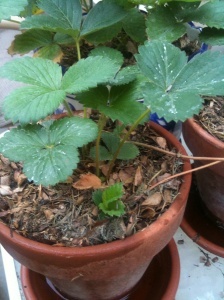 Water thoroughly, use a tray to capture excess water and keep the soil moist. In the heat, water evaporates quickly so be sure to check them often. Mulch, Mulch, Mulch A great way to reduce the amount of water lost to evaporation in the hot sun is to add a layer of mulch around your plants. It will act as a blaket to retain moisture in the soil, keeps the the weeds down and also provides nutrients back into the soil. 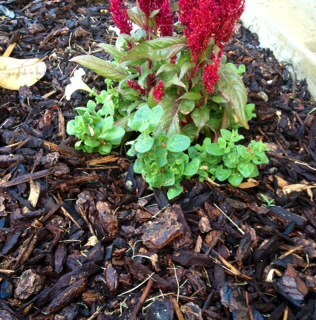 Be sure to avoid rubber-type mulches as they will attract heat and actually dry out your plants. Water at the Right Time Just like working out in the sun during the hottest part of the day, the same can be said for when you water. It's best to water in the early morning before temps begin to climb. 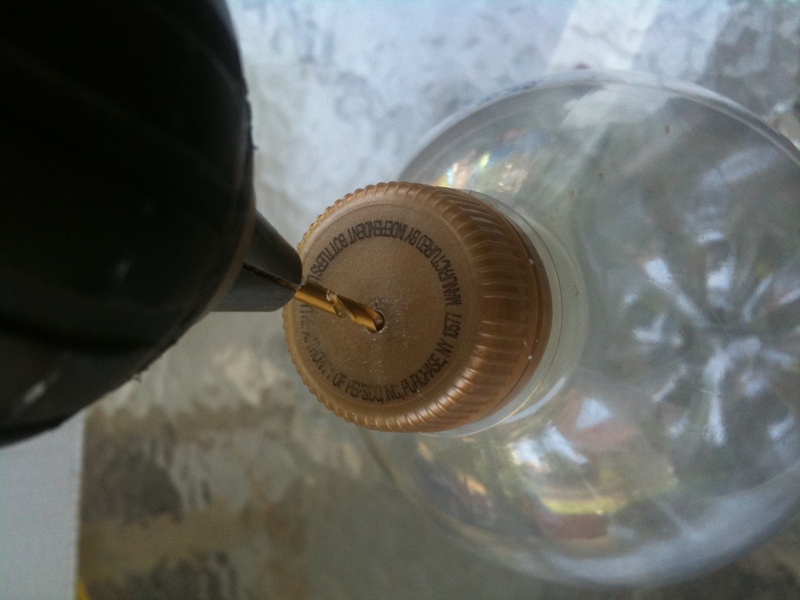 2 Turn the bottle over and drill one hole in the bottom so the water can flow easily. It's a cheap and easy way to keep your plants hydrated in excessive heat by providing plenty of water right where your plant needs it most. 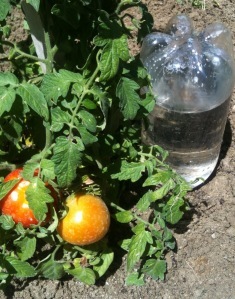 The slow, steady drip allows water to penetrate the soil and minimizes evaporation loss. 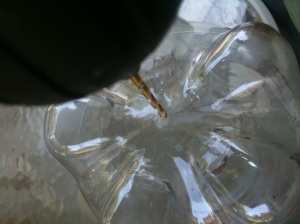 It's also a great way to reuse all the water bottles you've gone through keeping yourself hydrated! Good luck and stay cool in the garden.